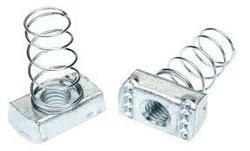 Leading Manufacturer of stainless steel spring washer, sems screw with washer assembly in stainless steel & mild steel and spring nut from Pune. Being a well-established organization, we are engaged in manufacturing, trading and wholesaling a distinguished range of Spring Washer. As per set industry parameters, this washer is manufactured by our adroit professionals using the best quality raw material and sophisticated technology. Extensively used in different machines, this washer is widely praised in the market. Moreover, clients can avail this washer from us at pocket friendly prices.